I am delighted to take on the Presidency of Friends of Science in Medicine (FSM). My first task is to acknowledge three founding members of FSM who, this year (2019) are standing down from the executive. These are our past President Emeritus Prof John Dwyer, past Vice-president, Emeritus Prof Alastair MacLennan and past Treasurer Prof Marcello Costa. They have kindly offered to continue their involvement as consultants. FSM was formed at the end of 2011 to emphasise the importance of basing Australian health care on evidence, scientifically sound research and established scientific knowledge published in peer-reviewed journals of accepted standing. Valuing scientific rigor is especially important in an age where unsubstantiated health claims are rampant and scientific consensus is ‘imbalanced’ by the views of extremists. As of February 2019, FSM has more than 1200 leading scientists, clinicians, lawyers and consumer advocates as supporters. We are as concerned about medical practitioners offering unproven and exploitive services, such as infusing intravenous vitamins and chelation therapy, as we are about Traditional Chinese Medical Practitioners claiming that acupuncture can treat infertility or Naturopaths advocating homeopathy. A related problem lies in those ‘alternative’ courses in health science that endorse dogma rather than critical appraisal of practice. Examples include Homeopathy, Energy Medicine, Kinesiology, Chiropractic “subluxation” theory, Cranial Sacral therapy and more. We encourage tertiary institutions and students of medicine and health sciences to critically appraise therapeutic products and services as part of the courses offered. Complementary medicines provide a fertile field for students to assess the often-outrageous claims made and report regulatory breaches. We engage with regulators, such as the Australian Health Practitioner Regulation Agency (AHPRA) and their National Boards, the Australia Competition and Consumer Commission (ACCC) and the Therapeutic Goods Administration (TGA) about our concerns. We are also a credible source of expertise to the government, parliamentarians and the media on these matters. Click here to see our current Executive and Support Team. Founding President and first Principle: Emeritus Prof John Dwyer PhD, FRACP, FRCPI, Doc Uni (Hon) ACU, AO, Emeritus Professor of Medicine, University of New South Wales. Founder of the Australian Health Care Reform Alliance. Clinical consultant to the NSW Government’s Inter-Agency committee on Health Care Fraud. 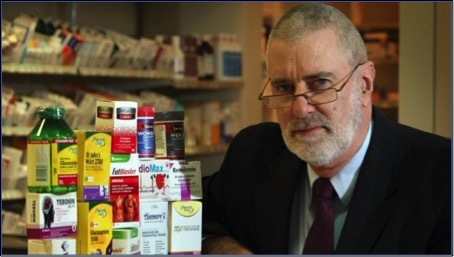 Founding Vice-President: Emeritus Prof Alastair H MacLennan MBCHb, MD, FRCOG, FRANZCOG, AO. The Robinson Research Institute, The University of Adelaide. Founding Treasurer: Prof Marcello Costa FAAS, Matthew Flinders Distinguished Professor and Professor of Neurophysiology, Flinders University. FSM was launched on the 20 December 2011 and its association was registered with New South Wales (NSW) Department of Fair Trading on 13 February 2012. The founders of FSM were and are concerned about the increasing number of health courses and interventions on offer to Australians that fall far short of this standard, as well as the inadequacy of the measures that are supposed to protect students and consumers from such practices. This is no alarmist statement. Many supposed health treatments have no scientific evidence of their effectiveness, some have been shown to cause harm, while many could not possibly work as they are incompatible with well-established principles of physics, chemistry, physiology and pharmacology. Many are pseudoscientific; assuming the trappings of scientifically sound practices to gain the credibility of these without subjecting themselves to the well understood tests of scientific examination that have proved so effective in giving us medical procedures and medicines that really work. We were particularly concerned that some of our universities were allowing pseudoscientific approaches to health education to be presented in health science courses without critical analysis of the principles behind them or of the claims of efficacy made for these procedures and treatments, including such practices as Homeopathy, Energy Medicine, Kinesiology, Chiropractic “subluxation” theory, Cranial Sacral therapy and more. All these approaches lack scientific credibility, but apparent endorsement of them by our universities can confer undeserved credibility on useless and sometimes dangerous approaches to healthcare. While suspect university courses provided the impetus for the creation of FSM, all aspects of the penetration of pseudoscience into our healthcare system concerns us. Many, such as Iridology, Reflexology, Rolfing, Homeopathy, much of traditional Chinese and Indian medicines, etc, are an affront to our knowledge of physiology and pathology and, relying as so many of them do on mysterious, undefinable, undetectable “energy”, could never be validated by scientific investigations as, virtually by definition, they have made themselves impossible to test. We would emphasise, however, that FSM strongly supports the need to conduct independent and disinterested scientific evaluations of those “Alternative and/or Complementary” therapies where the anecdotal evidence for benefit is strong and the underlying explanations are not incompatible with modern biological and physical sciences. Much that is of current therapeutic benefit was developed by such an approach. As FSM we are also aware of and concerned by the discovery of cases where poor scientific methodology and the fraudulent manipulation of data have occurred within the medical/scientific establishment. Some individual researchers and some of the major pharmaceutical companies have been involved in these unacceptable practices. While FSM deplores such activities, it recognizes that there are already many and increasing checks and balances within Medicine that aim to minimise such incidents. The same cannot be said for Alternative and/or Complementary medicine, which is why FSM is concentrating its efforts in this area. Valid scientific and medical research must adhere to well-established and widely recognized “best practice” protocols. FSM wants the evaluation of all potential health treatments to be subjected to similar standards for validation. When we informed the scientific and clinical communities of the establishment of FSM and sought support, we were overwhelmed with encouragement from home and abroad. As of January 2018, we have over 1200 leading scientists, clinicians, lawyers and consumer advocates, (listed herein), as supporters. FSM has no formal links to any industry or organisation and its executive members serve in a voluntary capacity. Speaking with a strong voice provided by our constituency we will make every effort to ensure that Australians have access to interventions and medicines backed by science-based tertiary education and scientific evidence of their clinical effectiveness. FSM will work towards ensuring that precious public health dollars are not wasted funding spurious treatments, many of which have actually been proven to be ineffective and thus dangerous, despite their small direct risk. With the efforts of hundreds of like-minded and knowledgeable Friends, we will strive to help the public understand the importance of a good evidence base for any treatment they are offered. We will advocate for regulatory changes that better protect the public from misleading, even fraudulent, health-related claims.